The last couple of days, I've been hearing some weird noises on the window sills. I had a suspicion what it could be. That was confirmed this afternoon. This is the window over the kitchen sink. Both girls, who were in the living room with me at the time he jumped onto the sill, dashed to the doorway of the kitchen and living room and watched. I managed to get this shot off before he dashed onto the branches at the NW corner of the house. In the spring, summer and fall, when there's nothing on the roof, I can hear them run across the roof. Two years ago, I had a raccoon try to rip up shingles and get inside the roof near the chimney. Zeke nailed those shingles down firmer than they were, even though he said they were still in good condition but he understood not taking chances. I have not seen any evidence across my roof or at the peaks on either side, that anything has worked its way inside to be in my attic, nor have I heard anything in the attic which would cause me to be suspicious. So why the sudden jumping onto the window sills? I had a few peanuts left so I scattered them across the deck yesterday. 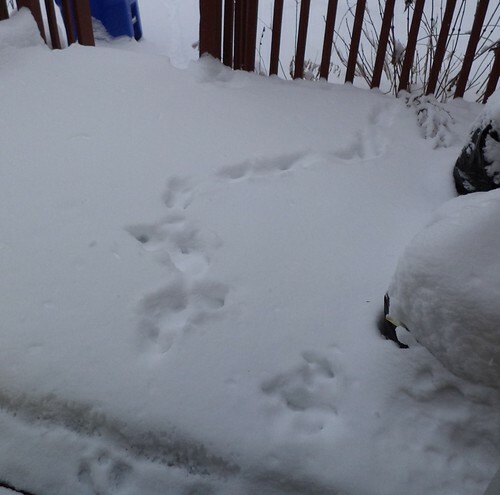 This morning, as I prepared to shovel, I saw squirrel tracks in the snow. We assume wild animals have the capability to endure outside in the bitter cold. There are locations, such as under my deck, where animals could go to be out of the wind and mostly out of the snow. Some of the acorn squash seeds were dry so I tossed them outside after getting home and shoveling off the deck, again. Those were gone in a flash. 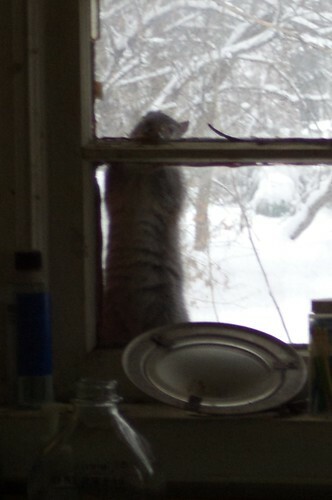 I'm not going to think too much about the squirrels, even the ones who peer in the windows. If I did, I'd worry myself to death trying to provide for their winter needs. 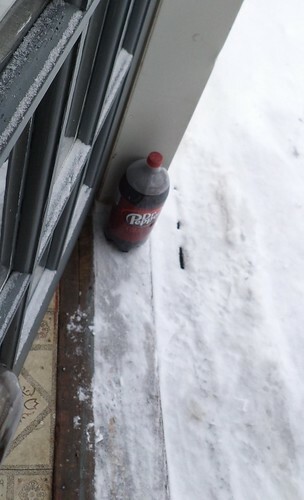 Just so long as they leave the Dr Pepper alone I had to stick outside because there wasn't room in the fridge.